Good Night Lake features ducks and swans, frogs, vegetation, water skiing, playing in the sand, hiking, swimming, lighthouses, fall colors, insects, camping, stargazing, canoeists, winter fun, and more. What could be more magical than a day at the lake? 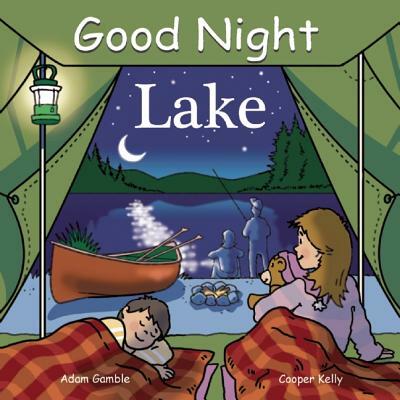 This charming board book explores all aspects of lakeside fun. Don't forget your bathing suit and fishing rod! Adam Gamble, is a writer, a photographer, and a publisher. He is the author of many books in the Good Night Books series, In the Footsteps of Thoreau, and A Public Betrayed. He lives in Sandwich, MA. Illustrator Cooper Kelly grew up in Connecticut and New York City and currently lives in Paris, France. He works in a variety of styles and has illustrated for a wide range of clients in adult and children’s publishing. He has illustrated about a dozen titles in the Good Night Books series so far, including the best-selling Good Night Beach and Good Night Dump Truck and the recently published Good Night Pirate Ship.